Here's our top choices for best snorkel vest on the market in 2019.
Who needs a Snorkel Vest? This horse collar type of snorkel vest can be easily placed over the neck, very comfortable to wear and is fabricated in different sizes to cater most adult sizings. It has a fast inflation system courtesy from its blow tube on the side that can create highly buoyant lift once fully inflated. This life-saving device can be deflated quickly by pressing in the blow tube where air will just freely flow out from the internal bladder. The whole device is supported with 2 straps that run across the waist and the other going around the crotch region. The positioning of the straps guarantees its users' both vertical and horizontal security where this life-saving device can withstand small waves. The buckles that secure the straps can easily be fastened and released for emergency purposes. 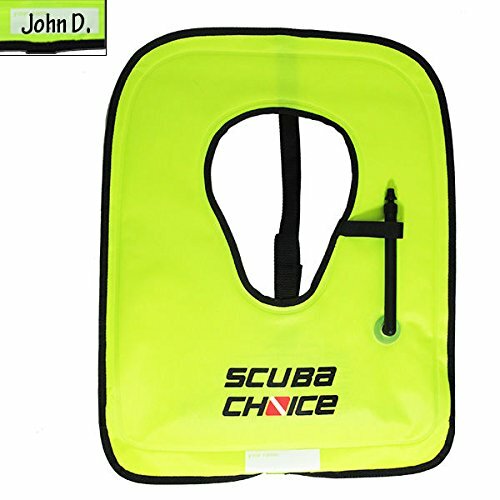 Aside from being offered in various sizes, the SealBuddy Inflatable Snorkel Vest is also provided in multiple neon colors where it is highly visible even on distance while on water. There are some downsides with the SealBuddy Inflatable Snorkel Vest where one of this is the length of the straps where it is relatively short and users with a big tummy, or large built may need to pre-order a longer strap. On the good side, this product comes with a free small mesh bag where it can fit this life-saving device when you fold it. Made from 420 Denier nylon and embedded with a rugged inflatable rubber, the Typhoon Sports Quality Snorkel Vest is one of the most durable life-saving devices in the market today. It is explicitly designed to cater to various body sizes and weight. For persons weighing 180 pounds (82 kilograms) and up, we highly recommend you choose the XL size. For teenagers weighing up to 80 pounds (36 kilograms), we recommend you select the youth size which can snugly fit the body of most young persons. 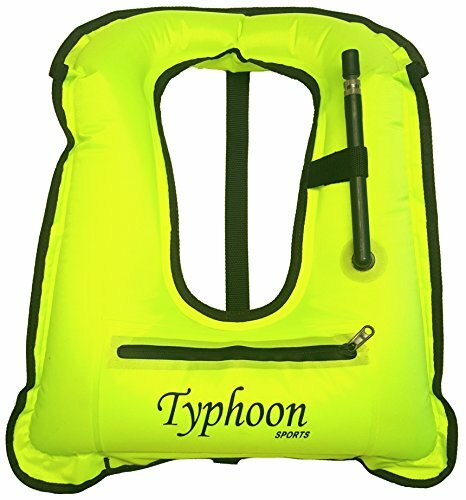 The Typhoon Sports Quality Snorkel Vest has a bright yellow colored fabric which is very important in spotting your presence while you are in the water. It has a double strap mechanism around the waist and another one going under the crotch region where it can be securely fastened to your body and can be able to withstand water motion without getting loose. Unlike the SealBuddy Inflatable Snorkel Vest that has a relatively short strap, the good thing with this snorkel vest is that it has a very long strap where it can be adjusted to fit most body built, regardless if you have a big tummy or not. It also has a zippered pocket in the front where you can place your personal belongings such as keys, rings, and other valuables. But you have to take note that the front pocket is not waterproof where some have inquired if they can safely put some cash and buy snacks afterward. Yes, you can place some small bills, but expect it to be wet after your snorkeling adventures. It comes with its own mesh bag where it is large enough that there is enough space for your snorkeling equipment like a gopro snorkel mask, fins, snorkel, wetsuit, and booties. The Scubapro Cruiser Snorkeling Vest is one of the popular hybrid types of snorkel vest. At the front, it looks like your typical horse collar vest, but without the collar. It still has the embedded inflatable rubber that can be inflated and deflated using the blow tube on the side. What makes it a hybrid type of snorkel vest is its material where it is made up of neoprene rubber. Aside from adding warmth to your body, the light neoprene material (take a look at our neoprene socks information here) increases your buoyancy control thereby adding more stability as you cruise along the water column. While the neoprene rubber covers your entire body up to the back portion, you are protected against UV radiation as we often spend hours snorkeling under the direct heat of the sun. It also has a convenient pocket use to store personal belongings. But again, may we remind you that this pocket is not waterproof. So it looks like a personal flotation device, so it is a full wrap around with neoprene in the back as a sleeve but only inflates in the front like a snorkel vest. As it does cost just a little more than your regular snorkel vest, you do get what you pay for. The full wrap around not only gives you a little extra warmth with 1/8" neoprene on the back it does more than just that. It acts as a sun protector because if you have even been snorkeling ever before in your life I can almost guarantee you have been burnt regardless of how tanned you may be already. For myself, I am quite fare skinned and this works perfectly because I don't have to keep applying sunscreen every 30 minutes and I can be in the water for longer periods especially if I am following around some green sea turtles in Maui! Also if it is a cooler climate, the vest gives you a bit of extra warmth as well. It is very easy to measure for this jacket and your best option is to go around your waist, just below your belly button and if you are in between sizes I would recommend ordering one size up. For sizing purposes, extra small can fit a waistline from 24 to 27 inches (61 to 68 centimeters); small size can fit from 27 to 31 inches (68 to 79 centimeters); medium can fit from 31 to 35 inches (79 to 89 centimeters); large from 35 to 39 inches (89 to 100 centimeters); and extra large from 39 to 43 inches (100 to 110 centimeters). If there is one snorkel vest that is designed for teenage use, then nothing beats the Scuba Choice Youth Kids Snorkel Vest. This small life-saving device, weighing only 9.6 ounces (270 grams) with a dimension of 18 x 19 x 1 inch (45 x 48 x 3 centimeters) can snugly fit any teenage body that does not weigh over 100 pounds (45 kilograms). Its strap is specially designed for ease of use and does not go up towards the head portion when fully inflated. While the Scuba Choice Youth Kids Snorkel Vest is classified as a horse collar snorkel vest, you must orient your children on how to properly inflate the device through the addition of exhaled air to the blow tube on the side and how to deflate it. It comes in a bright neon yellow colored fabric where it aids you in constant monitoring of where your kids are snorkeling and what part of the reef they are exploring. 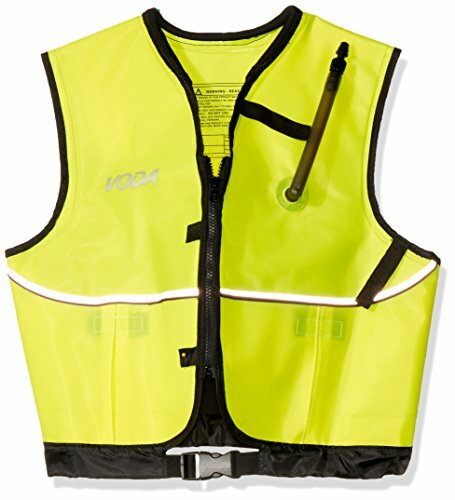 You have to take note that there is a white portion below the vest that is reflectorized. This is the area where you can place the name of your child. This feature will come in handy especially when several snorkel vest are mixed up, and the possibility of having two or more snorkel vest with the same brand and model mixed up can sometimes be high as this unit is considered a bestseller. Tired of the neon green, yellow or LED bland colors and want to stand out or at least have some spirit! Hot pink Scuba choice Adult Snorkel Vest is the one. 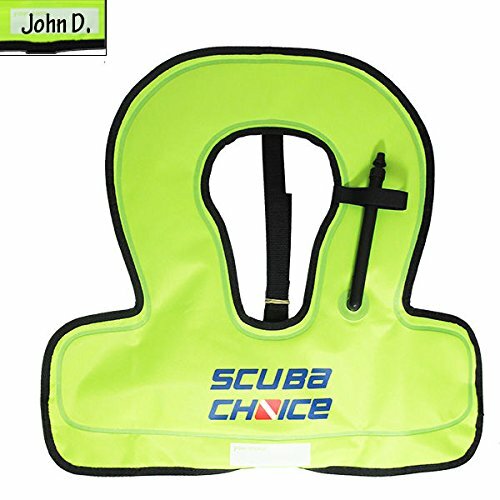 If you need your kids or spouse to stand out from the regular colors, you are sure to spot them with this snorkel vest. It has an easy inflator and deflator on your left side of the vest that makes it easy to get to from the left or the right hand. With 5 good breathes the vest is inflated and you are ready to jump in the water and go snorkeling for hours. With the easy deflating system, while in the water as you roll onto your back lifting the inflator into the air and squeezing the vest you can deflate quickly and then dive down deeper to take a closer look at the fishes. This vest is recommended for adults or youth from 100 lbs to 200 lbs and has removable straps for comfort and a crotch strap is included. The size of the vest is 21" x 17.5" so it is small enough to take anywhere on any vacation. It rolls up very small so you won't know you even have it in your suit case. The neck size is 25" so if you are unsure just make sure you take a quick measurement of your neck before you order. Another great option with inflatable jacket styled vest. The Phantom Aquatics give you more options for comfort. Instead of a slip over your head vest, it has a heavy duty zipper that makes the on and off process easy. If you are a little claustrophobic sometimes the snorkel vests going over your head can be an issue so the vest is a nice option. It has 4 adjustable straps that wrap around your sides so you can tailor the vest specifically for you and one in the front below the zipper. With the straps along the sides there is a mesh lining to keep you evenly in the jacket. It has a neoprene back from comfort and protection of the sun if you don't want to keep adding sunscreen every hour or so. The jackets are available in orange or yellow and has 3 reflective strips of tape on the front and back to make it even easier to spot in the water, especially if you are on a boat with lots of other snorkelers. The easy to use locking oral inflation valve makes it easy to inflate and deflate in seconds. You don't have to worry about fumbling around with the valve because it is attached to the left side of your jacket for easy access. IMAX inflatable adult adjustable snorkeling vest is your perfect started vest for kids and adults. Always look at the weight restrictions first. This comes in 3 colors including and LED option. Adjustable straps for comfort and easy to inflate and deflate with the oral inflation tube on the left. SealBuddy snorkeling vest comes in 3 colors, even purple for easy sighting. It has a waist and crotch strap for comfort and even comes with a bonus mesh carry bag so the vest won't get dirty. Easy inflate and deflate with 5-8 good breathes. 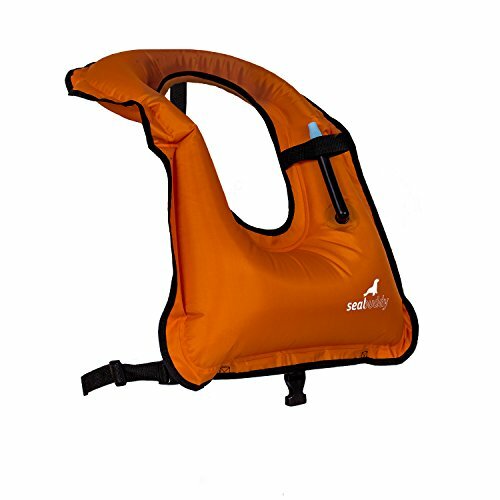 Ortizan unisex adult portable life vest is great for beginners and experts. Gives you the comfort and support you need to feel safe in the water. Adjustable straps and self inflating and deflating mouth piece on the left side of the jacket. Phantom Aquatics Jacket style zippered snorkel vest is more added to your gear by a full wrap instead of the normal horse collar vest. 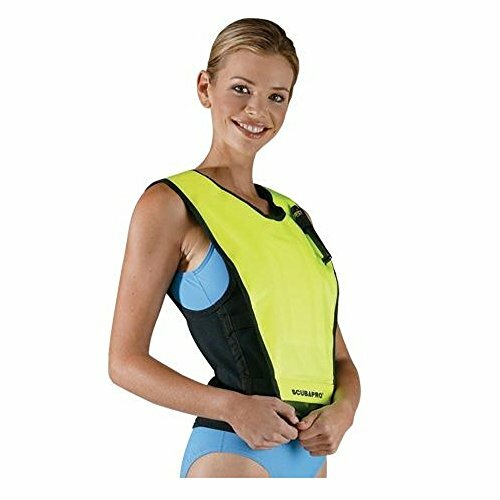 It has reflective tape for easy visibility and protection on your back so you won't get burned. Very comfortable. ScubaPro Cruiser Snorkeling Vest is a bit more but you get more with this jacket. Full wrap like a PFD. Form fitting and comfortable it will last if you are an avid snorkeler. Great for travel and fits in your suitcase with ease. ScubaMax snorkeling vest is available in 2 sizes: under 200 lbs and over. With more adjustable straps you will fit great into the life vest when you are snorkeling. Neoprene back and mesh sidings make a comfortable fit in and out of the water. New Wave Swim buoy is another option for snorkeling and swimming. It attaches around your waist and floats on top of the surface. If you don't like bulky vests or jackets when you snorkel this may work for you. Give you the visibility so people can see you and if you need to will keep you a float intermittently! Promate set has everything you need! Snorkel vest included. It has open heeled fins, single pain tempered glass lens and snorkel with purge valve and splash guard. Instead of ordering everything separate, this makes life easy! Neosport Men's 2.5 mm Xspan Vest is one of the most comfortable vest, however, not the best for diving deeper into the water. Keeps you afloat and warm with 2.5 mm layer. Protects from the sun and get for more than just snorkeling! Stearns Adult Life Vest is USA coast guard approved. If you need something a little more heavy duty and don't want to have to blow your life vest up and know you and your family and friends are safe, go with a 3 buckle life jacket. If you are a competitive swimmer and highly confident in the water, then using a life vest while snorkeling is more of a liability, rather than a safety asset, to your swimming performance since it will reduce your swimming speed as it creates drag in surface waters. You may in that case, consider marking your snorkeling spot with a ​divers flag. However, many of us who explores the reef at the surface does not possess these Olympic swimming qualities and wearing a snorkel vest while snorkeling becomes a mandatory piece of equipment. You don’t need to thread in the water consistently. Many of us can swim, but only a few can string at the surface. Initially, doing water threads can be natural. But as you do it over time, it can become exhausting and the longer you need to thread in surface waters would require more energy as your body becomes exhausted. With wearing a snorkel vest, you do not need to thread. All you need to do is relax, tuck in your legs and let the floatation characteristics of the snorkel vest do the floating for you. Snorkel vest can keep you warm. When you go snorkeling, you are most likely to be spending more time on the surface rather than underwater, especially if you are wearing a snorkel vest. Being on surface exposes yourself to the elements especially with wind and for the fact that water is generally colder than your core body temperature. Wearing a snorkel vest reduces body heat loss and acts like an upper wetsuit that traps body heat. Builds confidence and allows you to relax. Wearing a snorkel vest eases your mind about safety and as a precaution against drowning. With this, this eliminates your worries and the need to do constant threading where you can proceed in developing other snorkeling skills instead kicking your legs constantly to stay afloat. This, in general, builds your confidence and relaxes your body without consuming too much energy. Afterall, snorkeling should be fun and not an exhausting adventure. Unless you are a proficient swimmer and can swim for hours with no point of exhaustion I would highly recommend this to everyone. I am a swim coach and I even wear one because you never know what can happen in the ocean. If winds pick up or a current comes through the area you are snorkeling, anything can happen. For children and beginners it is perfect because it is a great way to get comfortable in the water but still have the freedom to swim under the sea surface and get a closer look at the fish or coral. Always think, what if, even if you have it around your body, it doesn’t need to be inflated but there just in case. If you have a couple children snorkeling in different areas it can put your mind at ease because you know they will be safe. Generally, a snorkel vest is a floatation device and may contain a positively buoyant material that can lift the weight of a human and stay afloat at the surface. Regardless of the positively buoyant material a snorkel vest is made (like inflatable rubber, neoprene, and styrofoam), snorkel vests are classified according to how they are fabricated. This type of snorkel vest employs an inflatable rubber that is embedded inside the vest. It is worn like a horse’s saddle over the head and has straps that help it secure in place. When deflated, this vest allows you to go underwater. But when you need to stay afloat at the surface, all you need to do is blow through the pipe where blown air inflates the rubber and will act similar to a buoyancy compensator device or BCD. This type of snorkel vest is the easiest to use as you only need to wear it like a jacket and to fasten its strap and buckle guarantees that it will stay in place even in occurrence of waves and strong current. This snorkel vest is usually made out of neoprene embedded with styrofoam packs. With this characteristics, you are guaranteed to stay afloat on the surface all the time. On the other hand, many have considered this feature a limitation as you cannot go underwater and cruise over coral reefs as the material is highly buoyant. Nonetheless, you are 100% sure that you will stay relax at the surface. There are new models out in the market that is a combination of the air inflated rubber bladders and embedded with small pockets of neoprene and styrofoam. This hybrid snorkel vest will initially give you optimum buoyancy courtesy from the small integrated styrofoam pads. However, as you need more buoyancy, you have the option to add air into the rubber bladder by blowing air from its pipe on the side. Make no mistake to allow the use of adult snorkel vest to minors. It’s a no-no. You have to be aware that a snorkel vest has to be worn with the right size. Extra large vest worn on a tiny body causes it to constrict the lower extremities and may cause swimming difficulties. On the other hand, an extra small vest worn on an extra large rib cage would squeeze its fit where its user can experience difficulty in breathing. Take note that most children’s snorkel vest is equipped with an understrap that is used to secure the vest without going up to the head portion while fully afloat at the surface and will not interfere with your child’s vision and/or breathing. For the many options of the snorkel vest you can swim with it inflated for your comfort especially if it is your first time or you have children who are just getting used to the water. As you progress you can keep it half inflated so you will be able to go under the water but then pop back up. When you are starting to get more experienced you can completely deflate the jacket and go under and back up as much as you want and when the day is coming to an end to get on the boat or you are getting tired you can just inflate the jacket and lounge out. Just like with shoes and clothes every brand, and type fit differently. So how do you make sure you get the right fit? The biggest factor is weight. Knowing how much you weigh is key. If it is in pounds, make sure you divide by 2.2 to get to kilograms or vice versa. If in Kilograms, times by 2.2 to get the accurate reading. The reason I say this, is because in some vest sizing charts it may be in kilograms or pounds so you want to make sure you have an accurate weight. With snorkeling vests there are different styles and types so you can look for length of straps. It will say how long the straps are so you can picture where the straps will be on your body and measure that with a tape measure. If you don’t have a pliable tape measure, use string or something that is pliable and then measure with a ruler after. In some cases you may see other sizing charts but if you are unsure, always go with weight. If you cannot find any size chart, take an extra peak at some of the other vests we have provided and hopefully we can help you find something that will work for you! Here is an example of what to look for. Now this may seem exactly like a snorkeling vest but the snorkeling life vest is a bit different. Instead of having a horse collar shape with straps around the groin and waist, this looks like a full personal flotation device but it only inflates on the front. For example, the ScubaPro Cruiser Skin Dive Safety Snorkeling Vest is one of our favorites and I will explain in full detail why it is different that your regular snorkel vest. Just like with the regular snorkel vest it increases buoyancy control and has an easy to us oral inflator and dump valve. However, this vest wraps around the whole body and has a 1/8" neoprene back sleeve that is more comfortable (for some) and adds that extra bit of warmth in case you are in a cooler climate or have not as great blood circulation. The full wrap around tends to make it easier sometimes and more comfortable when you are in and out of the water. The unfortunate things is that it is a bit bigger and bulkier so when you are storing your snorkeling vest in your bag or at home it does take up a bit more room. Also for traveling it can take up a little more space, even if you are already trying to cram more items into your suitcase. On the positive side though, most Snorkeling Life Vests have more space so they have a pocket that you can store items in such as your keys or water proof underwater camera or any other water proof item. For sizing on Snorkel Life Vests you want to measure from around the waist and in most cases if you are in between sizes always go up a size. When you are measuring around the waist you also want to make sure you are measuring parallel to the ground so the tape measure or string is not around your bum and then up by your chest, otherwise you will not get an accurate measurement. You want to find the middle point in between your belly button and your hips and have a straight line all the way around. This is very easy unless your child does not want to cooperate! Just as with adults your best bet is by weight if you are ever unsure. Next thing is if there is an option it will usually be for around the child's waist. For that, you want to take a tape measure or string (so you can line the string up with a tape measure after) and then go about an inch or 2 below the belly button. Keep the measurement parallel to the ground so you get a more accurate number. That will be the waist measurement. Usually you do not have to worry about the groin strap because they are usually proportionate to the waist line and always have extra nylon in that area. If you find there is lots of excess strap left you can always cut the extra part off and then BE CAREFUL and to stop the nylon from fraying you can burn slowly to seal it off. This is HIGHLY recommended to be done outside and with someone else just in case. Once you are set with your snorkel vest for your child, you won't have to worry because you know they will be safe in the water. Snorkel vests can be worn inflated, deflated, half inflated or whatever you choose to swim in. The snorkel vest sits around your neck and on your chest. They are highly visible and you can add or deflate the jacket to what fits you best. It has a strap (usually nylon) that wraps around your back and in between your legs for a safe and comfortable fit. It is a small strap, so not to leave any tan lines! Or you can put it just below your swimsuit. The strap allows you to move freely in the water without the vest swinging around your head and to your back. You can learn more about life jacket for snorkeling through the end of this blog post as well. At the end of the day, wearing a snorkel vest is just a guarantee that you will stay afloat at the surface. Wearing one does not permit you to explore reefs in extreme condition, like strong waves, strong current and the like. You also have to consider comfort and fit in buying a snorkel vest. After all, what good does a $100 snorkel vest do when it is too large for you and wearing it gives you an uncomfortable feeling.